Routine dental visits are an important part of maintaining oral health, and play a crucial role in the early detection and prevention of serious health concerns. Dr. Stephen Lipman provides comprehensive dental exams at his Windsor, CT, practice to help patients maintain healthy gums, teeth, and overall oral health. 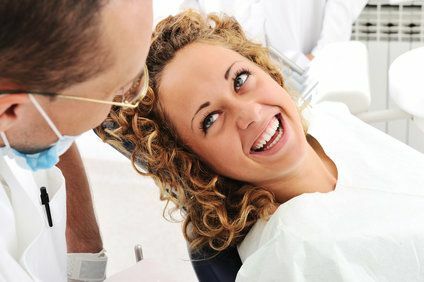 A dental exam includes preventive care, a periodontal evaluation, and an oral cancer screening to detect and diagnose oral health conditions in their earliest stages, when they are easiest to treat. If you would like to schedule a dental exam and receive more information about how we can help you achieve a healthier smile, contact us today. A dental exam is much more than a cleaning and overview of your oral health. It is critical in helping us diagnose health issues that could potentially lead to serious health concerns. Schick Computerized Digital Radiography (CDR): CDR is an advanced technology that allows Dr. Lipman to take digital x-rays of your gums, teeth, and jawbone. This state-of-the-art technology not only emits 80% less radiation than traditional x-ray technology, but also allows us to translate the image directly to our computer monitors, without waiting for film to develop. ViziLite®: According to the Oral Cancer Foundation, it is estimated that over 48,000 people in the United States will receive an oral cancer diagnosis in 2016. ViziLite® is a ground-breaking technology that has been proven to successfully identify soft tissue abnormalities, and help us identify oral health concerns before they become more advanced. Early detection can help make treatment quicker, simpler, and less involved. It also leads to an improved likelihood of recovery. Comprehensive Cleaning: During your cleaning, we will remove plaque or tartar that have accumulated since your previous visit. By removing this plaque and tartar, we can help prevent cavities and decay, which lead to more serious dental concerns and the need for restorative procedures. Teeth left untreated can cause extensive decay, resulting in tooth loss, jawbone deterioration, and periodontal disease. Following your exam, we will make proper recommendations to help you achieve and maintain good oral health. If you are in need of a restorative treatment, such as dental implants or crowns to improve the overall aesthetics and function of your smile, we can explain these procedures. Additionally, if you wish to enhance to look of your smile, we can review cosmetic treatments, such as teeth whitening and porcelain veneers. A dental exam is much more than a cleaning and overview of your oral health. It is critical in helping us diagnose health issues that could potentially lead to further health concerns. Dr. Lipman and his well-trained staff of professionals at Family Dentistry of Windsor offer friendly and caring attention for patients of all ages. To maintain a healthy, attractive smile, schedule your consultation today.